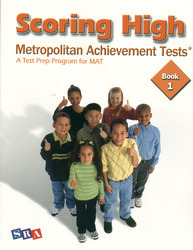 Scoring High - Metropolitan Achievement Tests (MAT 8) offers more practice students need in essential reading, language arts, mathematics, and study skills. The program includes a new complete practice test, separate Student and Teacher Editions, updated questions, and helpful tips to give students the confidence they need to excel in testing preparation. Two color, soft cover, 120 page consumable workbook.